Over one hundred years ago, interurban trains began carrying freight, mail and passengers throughout Midwestern cities. At its peak in the early 1920s, the systems were part of an extensive network covering cities such as Port Huron and Detroit with lines to Toledo, Ohio connecting to Cleveland to the east, Columbus, Dayton and Cincinnati to the south, and Indianapolis, Indiana and Louisville, Kentucky to the southwest. Here in Michigan, much of the southern part of the Lower Peninsula area was served by these interurban car companies. Running though my town of Chelsea was the Detroit, Jackson and Chicago, later to be called the Detroit United Railway (DUR). Running off electrical power supplied by generator plants (the nearest one to Chelsea was located in Ypsilanti) the voltage was sent on overhead wires to substations whose job it was to convert that power into usable levels, enabling the cars to run their rail routes. These cars provided opportunities for family outings, travel to and from work, company outings and trips to athletic events. My friend, George Prinzing of Chelsea, now deceased, related to me that he and his friends used to pay a quarter, for which they were given a round trip to the game in Detroit, and a ticket to the game itself. (How long ago was that?) I also recall my mother telling me, when she was a student at the University of Michigan in the 1920s, she would ride the interurban cars back and forth from Port Huron (she lived in Sarnia, Ontario on the other end of the river). She and the other passengers would encourage the motorman to &apos;opern her up&apos; south of Port Huron on the way to Richmond. I can still hear the excitement in her voice! Let us move from the general to the specific, and to the subject of this article. As a child sitting in my paternal grandparents bay window seat in Washington D.C., I would watch the streetcars pass by on their way to the car barn around the corner from the Lincoln Park brownstone step up. The vehicles with the blue/green sparks coming off the wands overhead, their green and cream bodies, the humming noise as they increased their speed, the sound of the warning bell, all left a permanent impression on a young boy of four. When I moved from Ann Arbor to Chelsea, this interest was rekindled by a tour of the local remnants of the interurban conducted by retired social studies teacher and longtime resident, George Prinzing. He showedme the surviving roadbeds, tree corridors, the site of the surviving DUR substation building (owned and well cared for by Jan and Dan Roberts), and other traces of the now defunct system. Following the stimulation provided by Mr. Prinzing, I came across a series of books written by (among others) Billie Henning, a teacher at Macomb County Community Collage. Contacting Billie, as he prefers to be called, a series of emails commenced which led to a challenge from him for me to find an old interurban car, somewhere near Grass Lake, which he had taken pictures of in the early 1990s. Tracking it down to Gillette Lake, near Jackson, I met with the owner, Ed Greca, who very kindly indulged my enthusiasm, answering all my questions about his car, which he uses as a storage area. The car made by the St. Louis Car Company in the early 1900s, is directly on the lakefront and is in rough condition. As Mr. Graeca was on his way to work in Ann Arbor, he promised to show me his car at some future date. That is another story. However, on my way out, he mentioned that there might be a another car on Duck Lake, but he hadn't had the opportunity to verify its existence. Taken sometime during 1939, this photo shows the car prior to being owned by the Mixter Family. Photo from the Mixter family collection. Consulting my maps of Washtenaw County, I could not find any Duck Lake. Finding a Goose Lake, and thinking that Ed may have given me the wrong name, I drove there and began pestering the residents, asking if they knew of any interurban cars in the area. After receiving a series of blank looks, and feeling very discouraged, I was ready to abandon my search. As I was turning to leave, a man came out of his garage and asked if I needed help. Explaining my purpose, he stated that he knew of no interurban cars on Goose Lake, but he had fished at a Duck Lake many times, and it was over near Albion. Returning home that day, there was a message from the Grecas on my voice mail. It said the lake I was looking for was over by Albion, and that I should take Charlotte Landing Road off of Twenty-eight Mile. Off to Albion the next weekend, turning north onto Twenty-eight Mile Road off of I-94, I began inquiring about any cars that might still be in the area. At the township hall, a clerk told me that there had been an interurban car converted into a dinner, but it had burned down in the early 1950s. This was disappointing news, but seemed to indicate that I was on the right track (no pun intended). Driving down Charlotte Landing road to the lakefront, I inquired of several residents about the existence of any interurban cars locally. I was told that there had been a car which was removed to the Illinois Railway Museum (IRM), located in Union, Illinois in the early 1970s. However, one gentleman, who asked not to be identified, said that just up the road, with its unmistakable cow-catcher and curved nose, was a beautifully preserved interurban car. 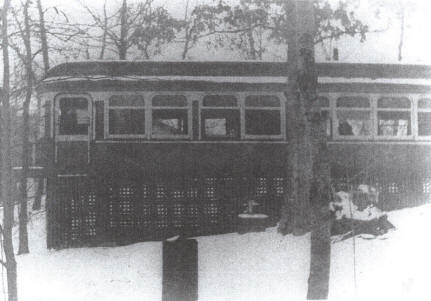 A survivor from the past - the front of the interurban car owned by Dr. and Mrs. Mixter of Columbus, Ohio. Here you see the motormen's compartment as well as later additions to the car. All remaining photos by George Sparrow. The name on the mail box was Mixter, but as there was no one home. I left my name, phone number and address, and a short note asking them to contact me. Before I left, Ken King, whose house was directly across the road, gave me the name and address of the owners of the car, Dr. and Mrs. Keith Mixter, of Columbus, Ohio. Later, contacting the Mixters, I made arrangements to visit them in their summer home in early August. On the 11th of August, 2004 I stepped into this relic of days gone past with great anticipation. 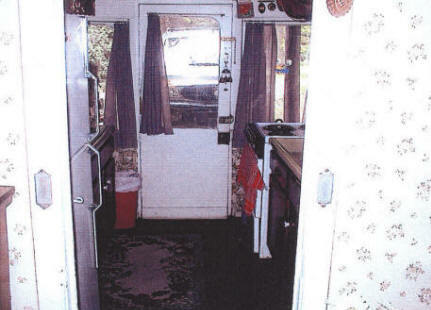 Entering the converted car through the motorman&apos;s space (which faces away from the lake to the east) I found myself in a kitchen with cupboards on either side of the walls, with counter tops and cabinets below them, a refrigerator and a stove (photo immediately below). Continuing further into the car (toward the lake) one passes though partitions which led to the main passenger section. On either side of these partitions were still mounted the original brass match strikers. Also, present were the two-layered, pressed-glass windows. These windows are operated by pinching brass levers together, which pull brass pegs out of holes drilled in the windows jambs, and after raising or lowering the windows to the desired level, releasing the levers, which re-inserts the brass pegs back into the jambs. Looking east towards the rear of the motorman's compartment showing the brass match-strikers on either side of the doorway. At this point in the tour, Dr. Mixter pointed to the area above the motorman&apos;s location in the kitchen area, and stated that behind a wooden cover was the original brass headlamp. Unfortunately, we did not have time to remove the cover and view the lamp, but it was exciting to know that this rare artifact was still in its original position. Passing further into the car, Dr. Mixter explained that when the family moved into the car, in the late 1930s, there had been a Franklin stove in what is now the kitchen area. I later found out from Norm Krentel, who supervised the move of the interurban car (former Michigan Electric #28) from Duck Lake in the 1970s, that such stoves were used to supply hot water for heating the cars, using technology first developed by the Romans two thousand years ago. Moving further into the living area of the car can be found a pleasant living/dinning area with chairs, tables with lamps on them, and other amenities on either side of a narrow path. This originally would have been the main passenger seating area, filled with two columns of bench seats, each (according to the Mixters) with soft, dark green cushions and back supports. Printed on the fabric was a delicate floral pattern in a darker green. 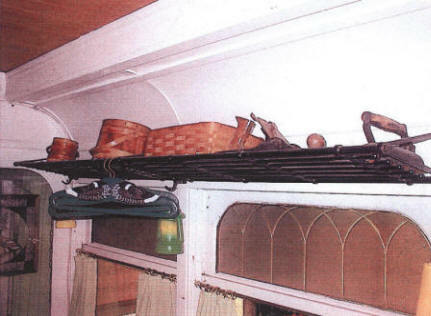 Above the furnishings on the south side of the car were found the original black luggage racks made out of wrought iron (photo below). 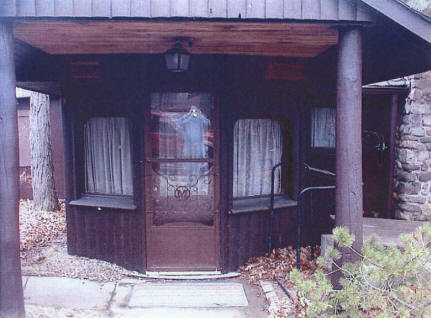 The original pressed glass windows and black luggage still remain. Some years after the Mixter family purchased the car three additions would be built on to it, to expand the living space for a growing family. Dr. Mixter explained that the first addition was done in the early 1940s on the northeast side. The work was done by his father and grandfather who were both carpenters. 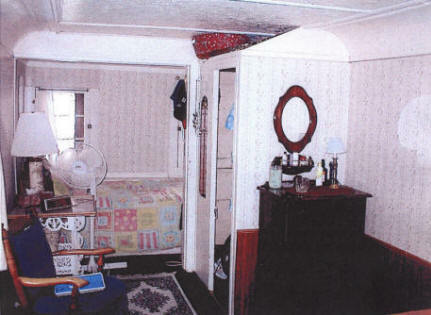 In this room was built the fireplace of fieldstone, space for a bed and dresser set, and an indoor toilet. The shingled roof was added at this time as well. Looking from the inside of the car, one can see the additions that have been built on to the car over the years. 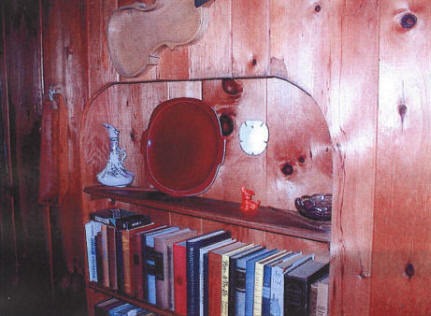 A book shelf, part of the second addition, shaped to resemble one of the car windows. The second addition was added to the west end (again on the north side) containing a huge living room, with a large bay window looking out on the lake, with shelving built into the shape of the exterior car window (lower photo above), and room for a large sofa and dinning table (top photo above). Continuing along the interior of the cart toward the lake is found the original lavatory (first photo below). Inside the door we see the pipe vent, now covered with a metal plate, the commode area and above one&apos;s head, the original pressed-glass skylight (second photo below). This glass contains a beautiful floral pattern with a tinge of pink, and is an important clue in dating the age of the car. Dr. Mixter explained that when the family first moved into the car, the area closest to the lake was turned into a bedroom for his sister, and they had to remove some of the bench seats to make room for her. 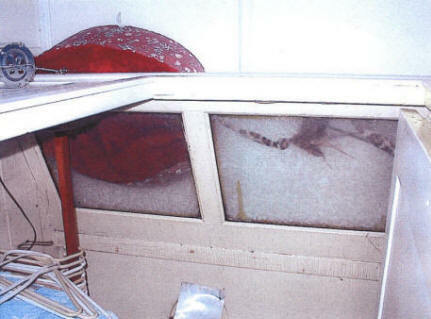 He went on to say that his "bedroom" became the area behind a blanket, hung across the middle of the car. The original lavatory looking to the west. Detail in the lavatory showing the original floral patterned glass and the now covered exhaust pipe. I asked Dr. Mixter about the external colors of the car when the family purchased it. 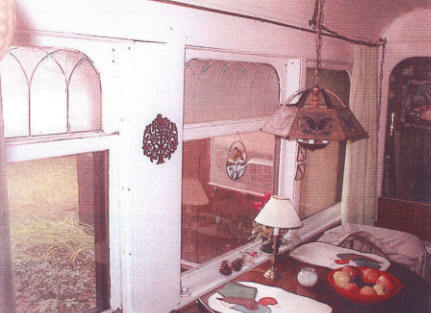 He said that the outside was green and cream around the windows, while the interior wood was a dark mahogany color. Mrs. Mixter told me that she remembers the colors of their car being in contrast to the colors of the car (Michigan Electric #28) that had been located just down the road. The colors of that car were red and cream trim on the outside, with the cushions being a bright red with an impressed floral pattern. Mrs. Mixter also mentioned that they had some artifacts from their car and asked would I be interested in seeing them before I left? She brought out a large brass handle that had been attached to the interior of the lavatory. It had been used to provide stability for males seeking to steady themselves when attending to their duties. Next, was a lock with a key in it made by a firm in Newark, New Jersey, and finally an unused rail spike (photo below). 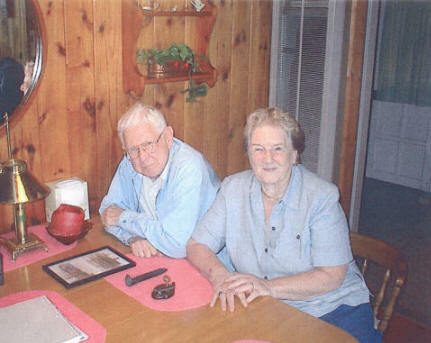 Dr. and Mrs. Keith Mixter, sitting in the Westerly addition, with the artifacts from their car. After a cursory look at the underside, containing the plumbing and custom-built shed, and showing that the flooring was in excellent shape, I took my leave of the Mixter&apos;s and their wonderful relic. Lawsuits by injured passengers and family members of the persons killed in a series of horrific accidents sapped the profits of the interurban companies. Those costs, on top of the growing competition from private motor vehicles and truck companies, all contributed to the demise of the interurban electric car systems. Sitting in my car at a crossroad leading out of the lake area, I couldn&apos;t help but think of the Mixter family's efforts, which has resulted in preserving this interurban car as a reminder, to current and future generations, of what once was. I also wonder how many other similar cars may still remain, hiding in the state of Michigan.